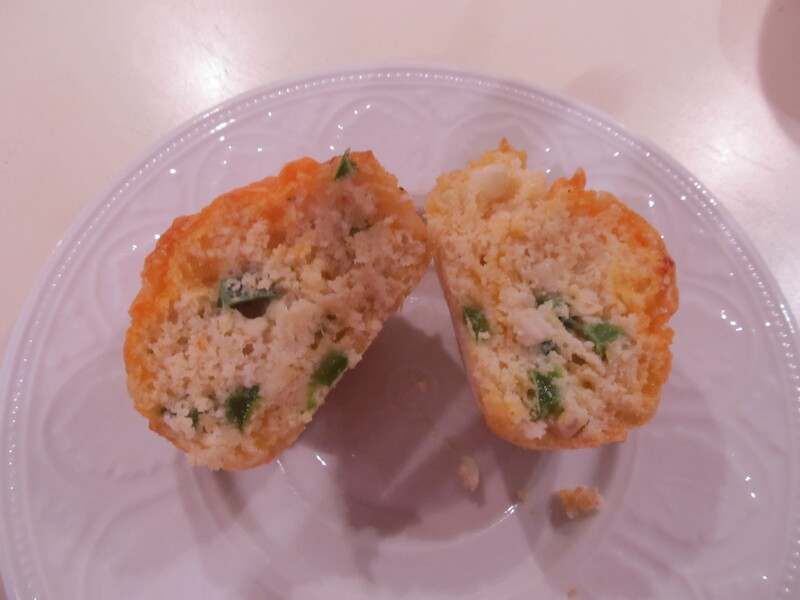 My friend, Matt Smith, posts some great pics and recipes of yummy dishes he makes from time to time. 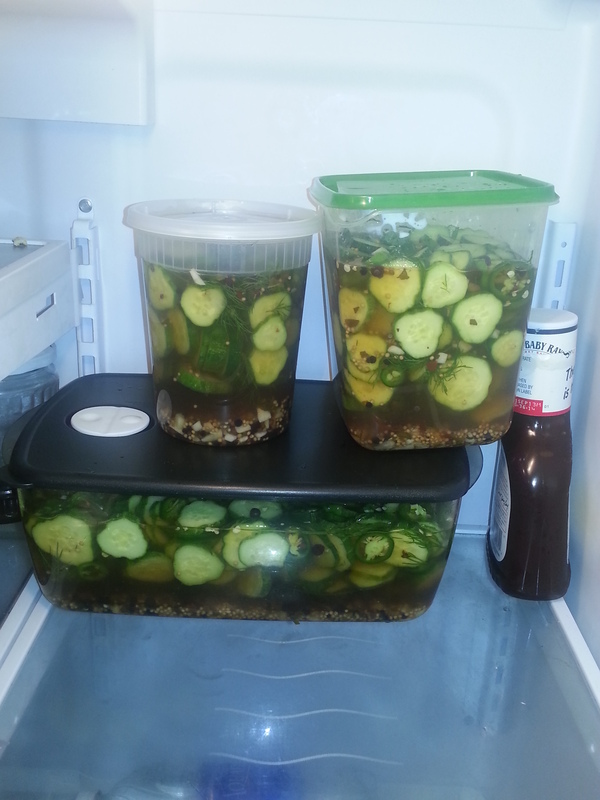 Earlier this summer he posted a pic of a giant vat of pickles that he had just made. 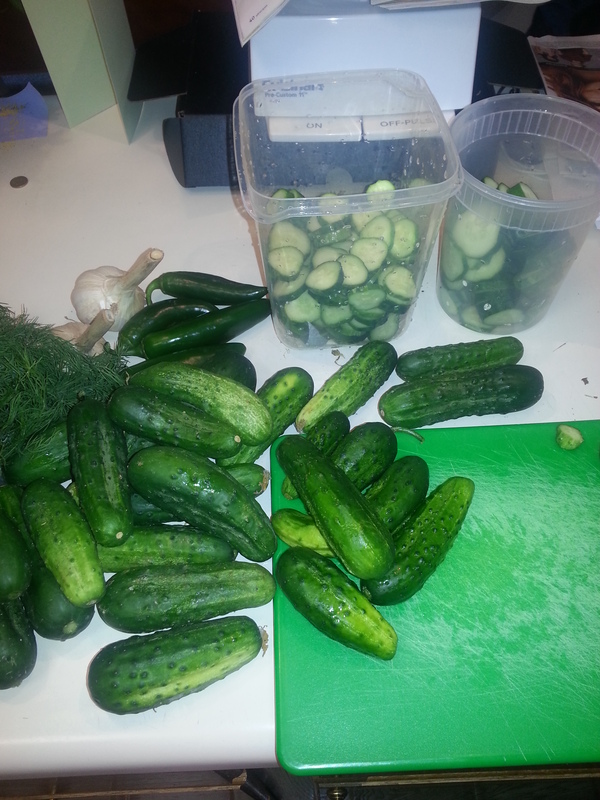 And all of a sudden it dawned on me – I desperately want to make pickles. He graciously gave me the recipe he used. 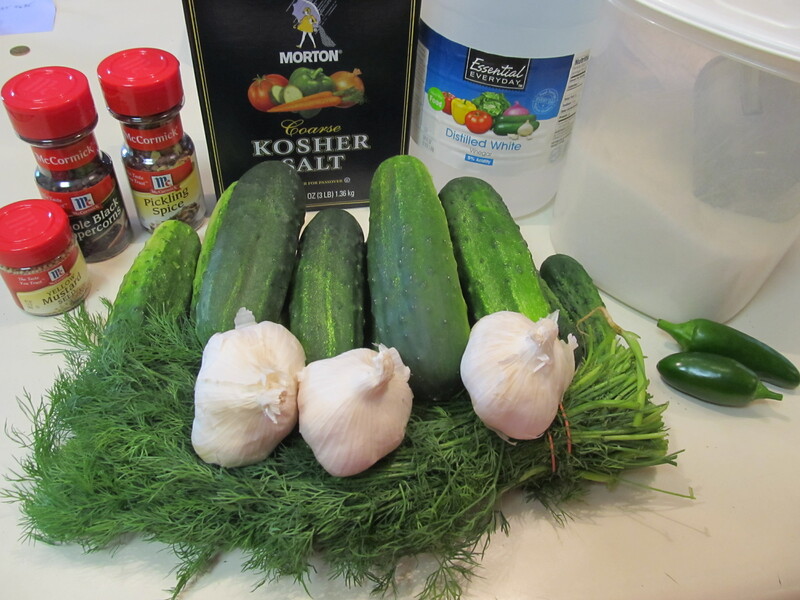 As soon as I saw it, I knew this was the perfect pickle recipe. The hardest part to this recipe? 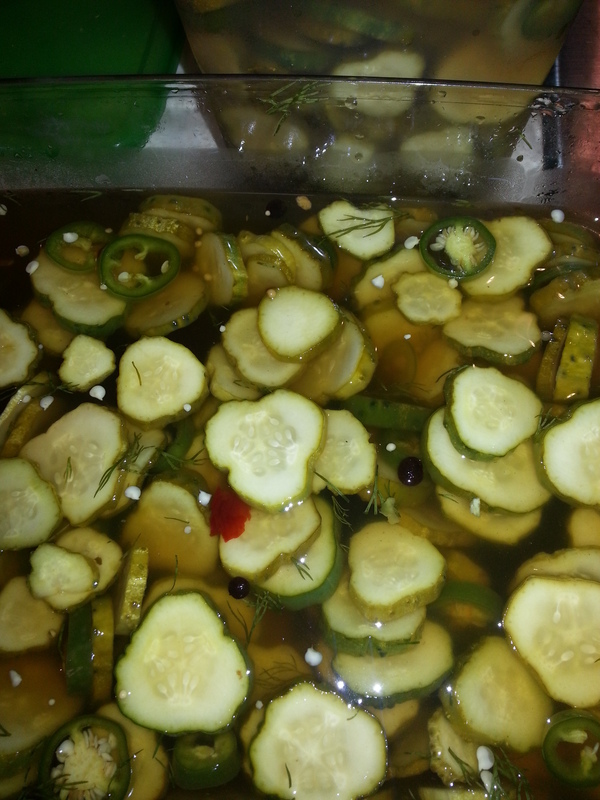 Waiting for the pickles to marinate for a week…..It takes SO much patience. Every time I opened the fridge, those pickles were staring at me – daring me to take a taste. Look at them….mocking me. But I resisted. And my hard work paid off. These pickles are incredible. They might not be for everyone – so you might want to tweak the recipe. Tweak away, friends! 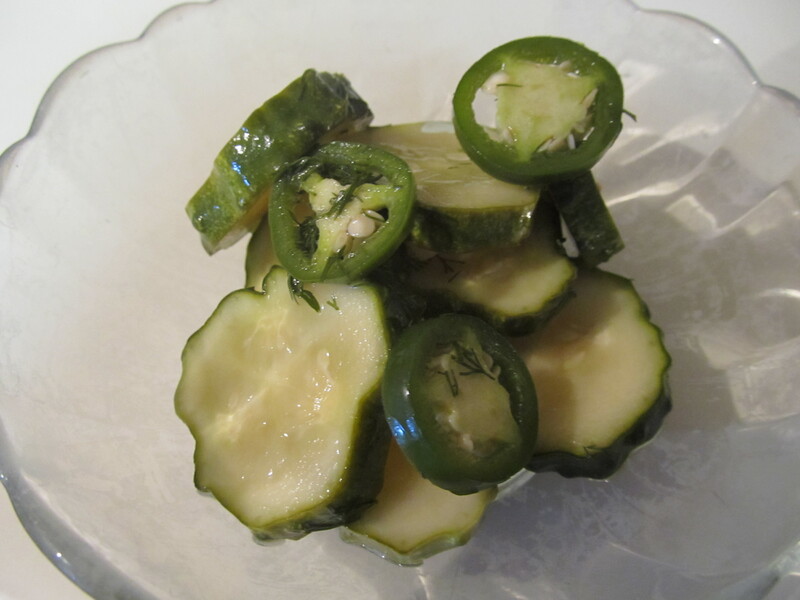 These pickles are tart and have a definite vinegar flavor. They mellow over time. 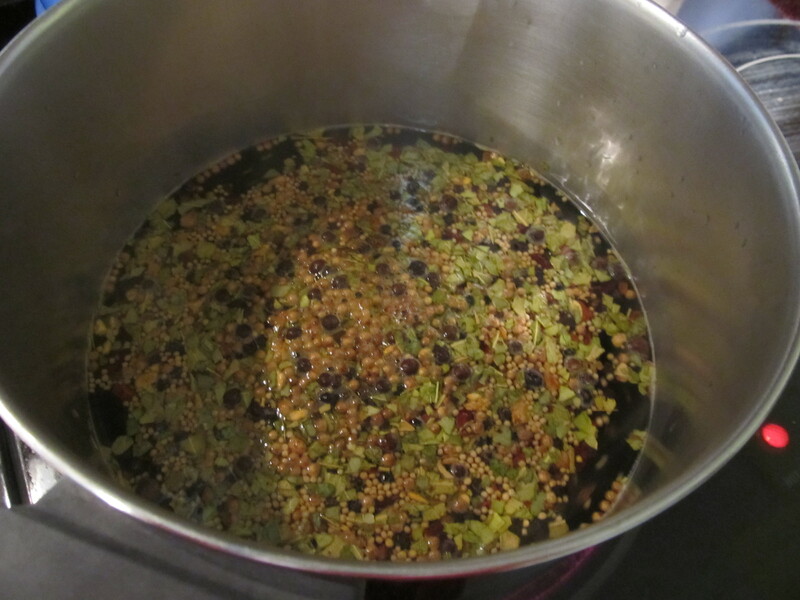 I highly recommend draining all of the spices/seeds/dill/peppercorns out of the liquid when the week is up. That way they don’t continue pickling while you eat them (and you don’t reach into the vat and pull out a strand of dill or random spice). 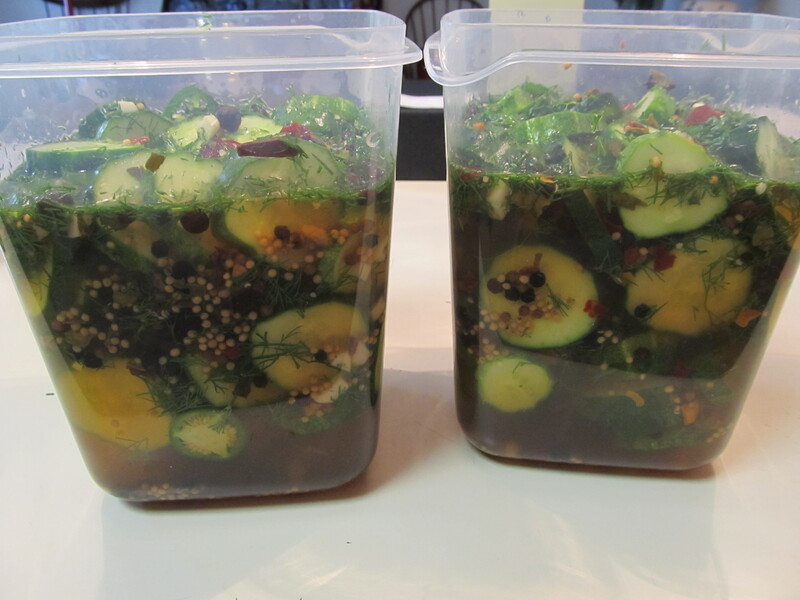 Make sure you prepare a large container – at least a 3.5 quart container – to hold your pickles. Combine the remaining ingredients in a large saucepan and bring to a boil over high heat. 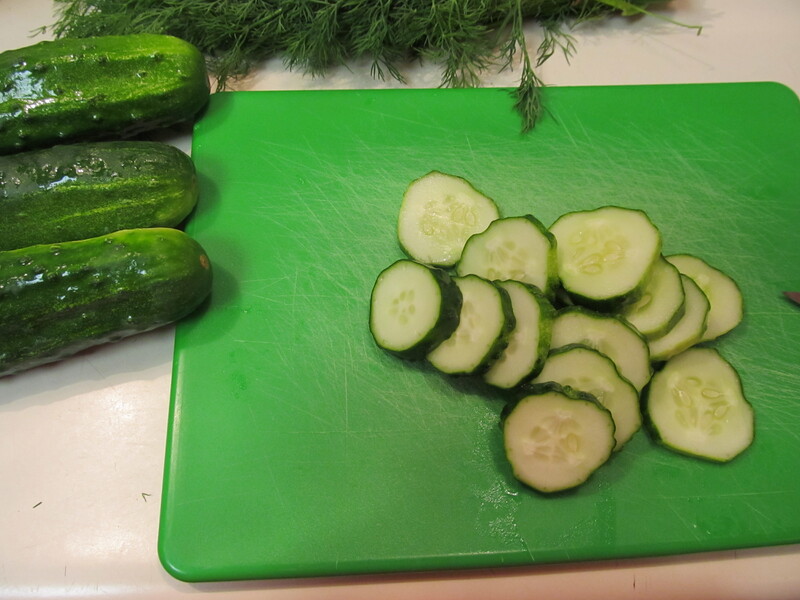 Pull the pan off the stove and let the mixture cool down while you slice your cukes. Prepare garlic, jalapenos, and dill. Slice your cucumbers into ½ inch-thick rounds – you can slice thinner if you like as well. 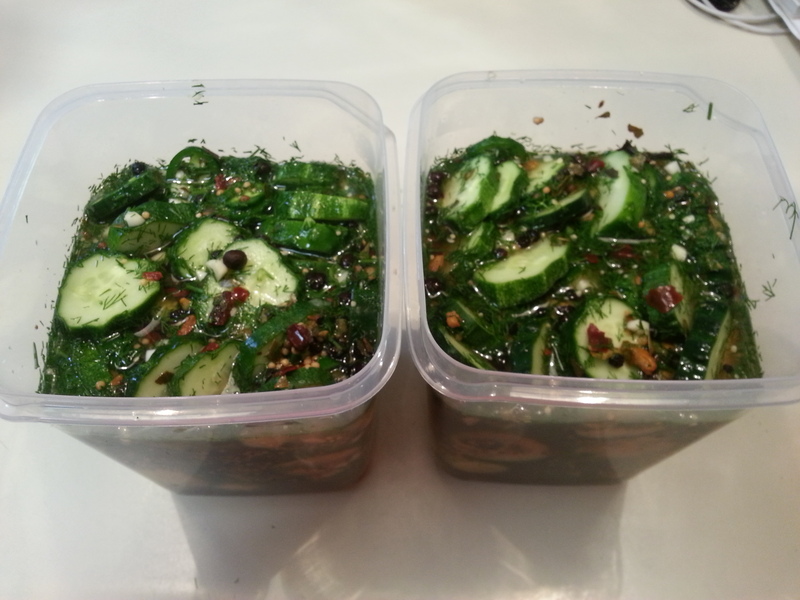 Put them in your container along with the dill, garlic, and jalapenos and mix well. 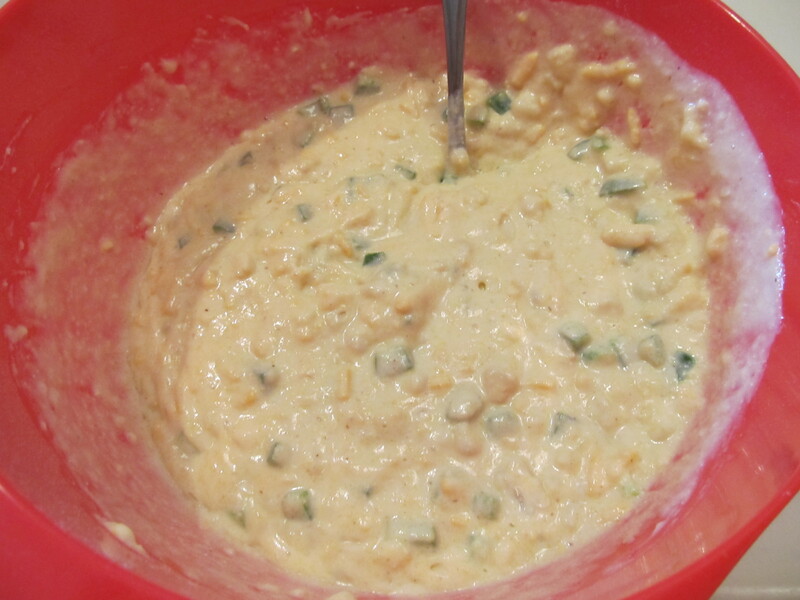 Pour the mixture over your other ingredients and make sure everything is all mixed around and ingredients are distributed. Cool to room temperature and cover. Here comes the hardest part: put them in the fridge and don’t touch them for a week unless you are going to shake them up a bit. 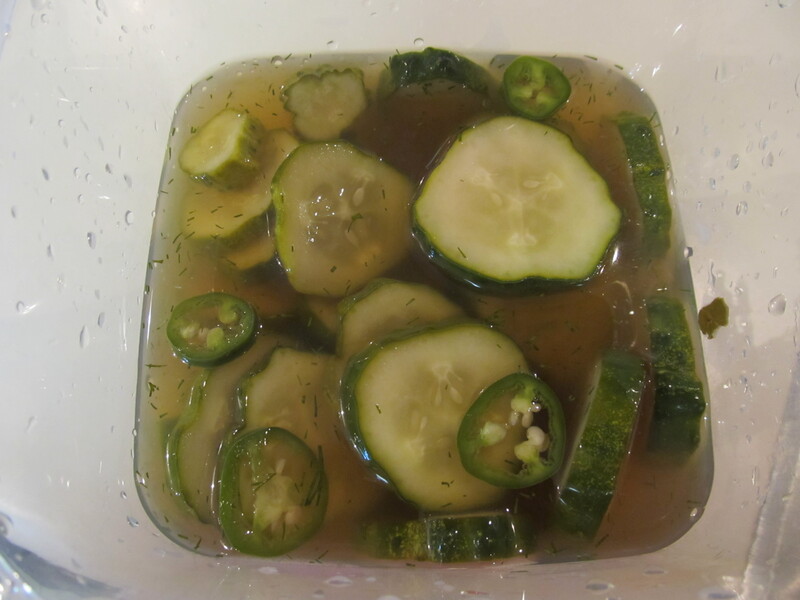 This recipe makes a TON of pickles and they keep for weeks! Who doesnt love salsa? Seriously…..find me someone who doesnt LOVE salsa. Robb has the Rick Bayless “Mexican Everyday” cookbook. It has become one of our mexican cooking bibles. 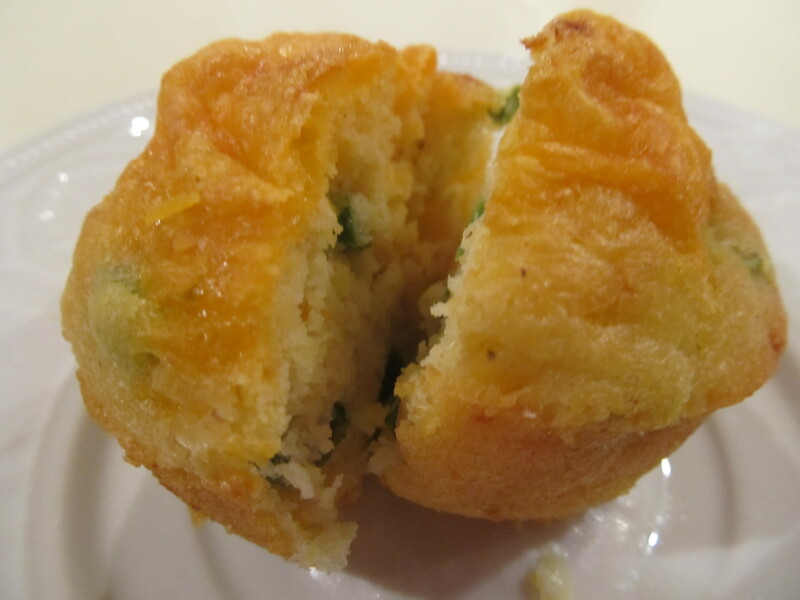 This tastes divine – you can taste the roasted garlic and peppers. You can taste the freshness of the ingredients. And it’s simple to make. I made it for Mexican Supper Club back in October and it was a huge hit. 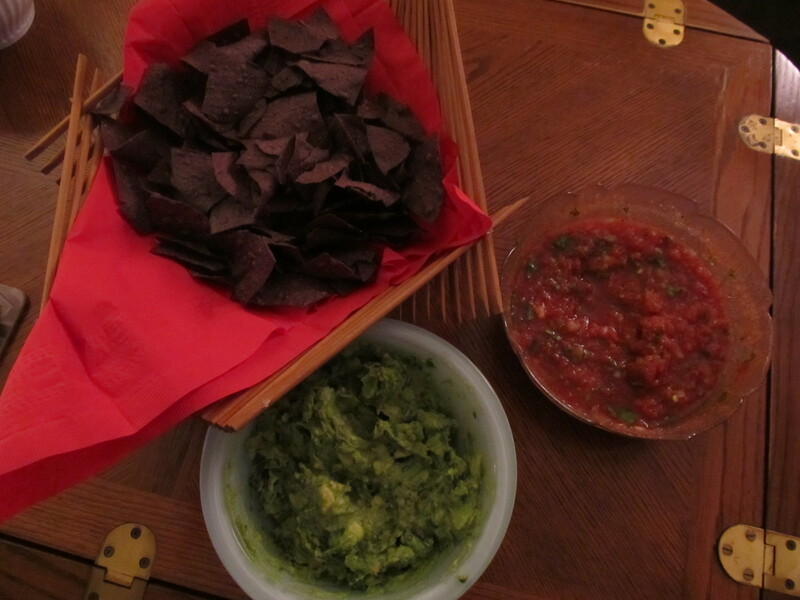 I made a regular batch and then I made a SPICY batch for John and I.
Salsa is already a party food staple. Why not make your own at home? It’s so much healthier for you and you can modify it however you like! Remember to wear gloves when you handle/chop the spicy peppers – dont want to burn your skin or touch your eye later on! Set small skillet over medium heat. Lay the chiles and garlic in the skillet and dry roast until soft and blotchy black in spots, about 10 minutes for the chiles and 15 mins for the garlic. While chiles and garlic roast, scoop onion into strainer and rinse under cold water. Shake off excess water and pour into medium bowl. 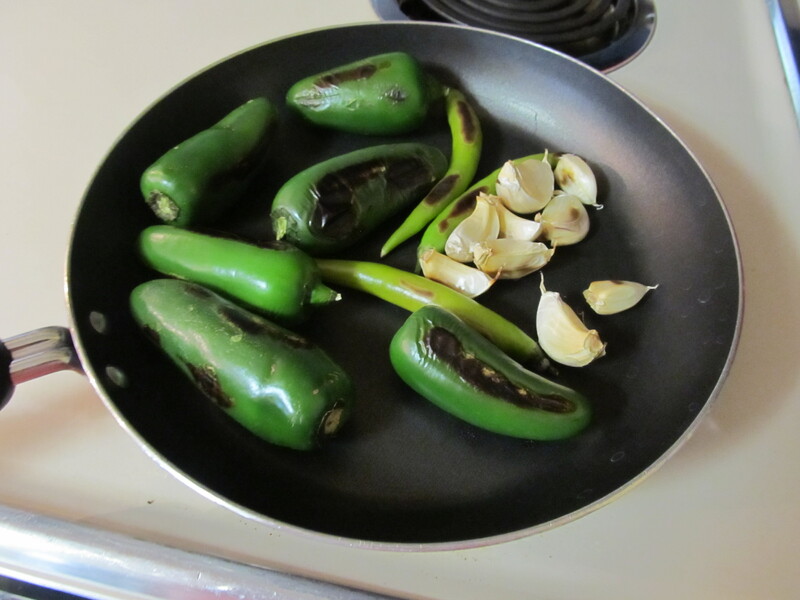 Pull stems off the roasted chiles and peel papery skins off the garlic. Scoop them into the food processor and pulse until they are finely chopped. 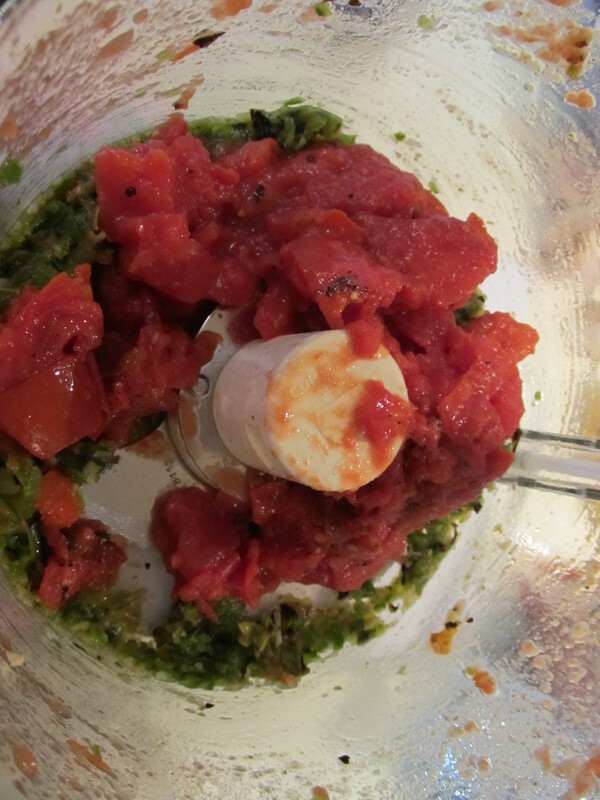 Add the tomatoes with their juice, re-cover and pulse a few more times, until the mixture is as coarse or smooth as you want your salsa to be. Pour the mixture into the bowl with the onion. Add cilantro and stir thoroughly. 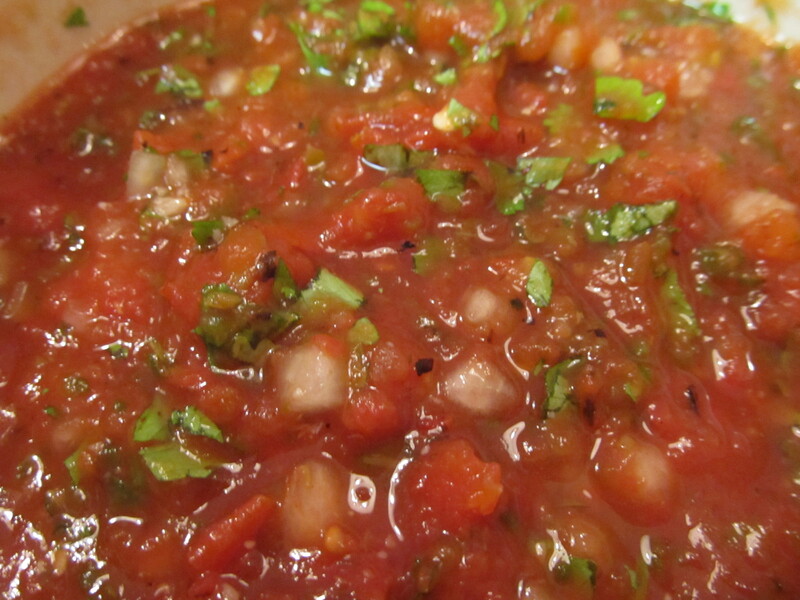 Thin with water if necessary to give salsa an easier consistency (I typically do not do this). 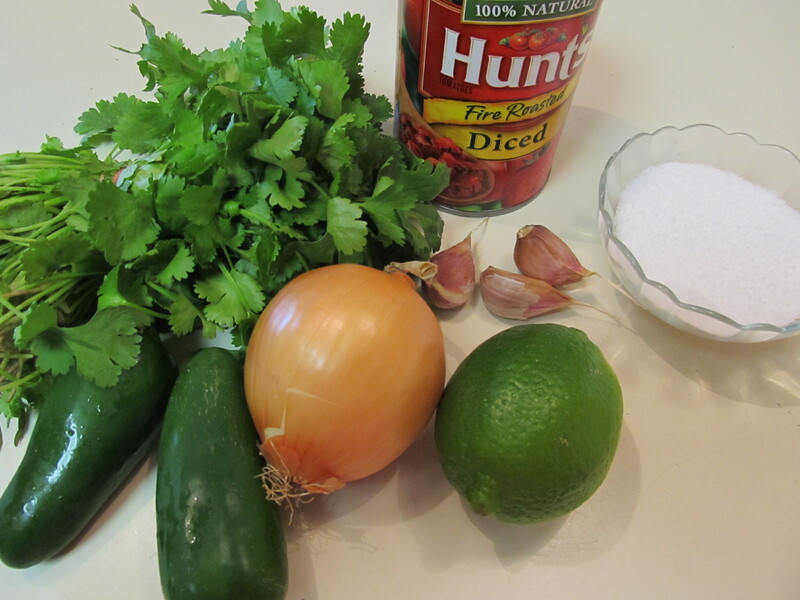 Taste and season with lime juice and salt – I tend to go heavy on these two items. NOTE: If making salsa ahead of time, refrigerate and don’t add onions and cilantro until ready to serve. My dear friend, Liz Kaiser, was texting me earlier this week looking for good cornbread recipes that include whole kernels of corn. She was looking for a moist cornbread recipe to showcase the corn. 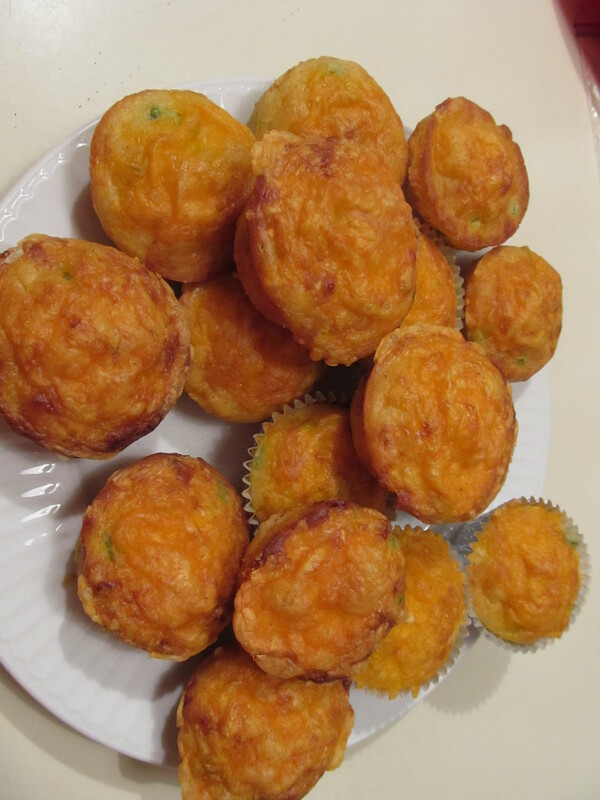 My cornbread recipes didnt have what she wanted, but I quickly found a couple decent recipes on foodgawker. Then I told her she was crazy for baking in this heat, to which she agreed. And then I proceeded to bake both these and a birthday cake for Robbbb on the hottest (102) day of the year…..who’s crazy? Oh, right….. 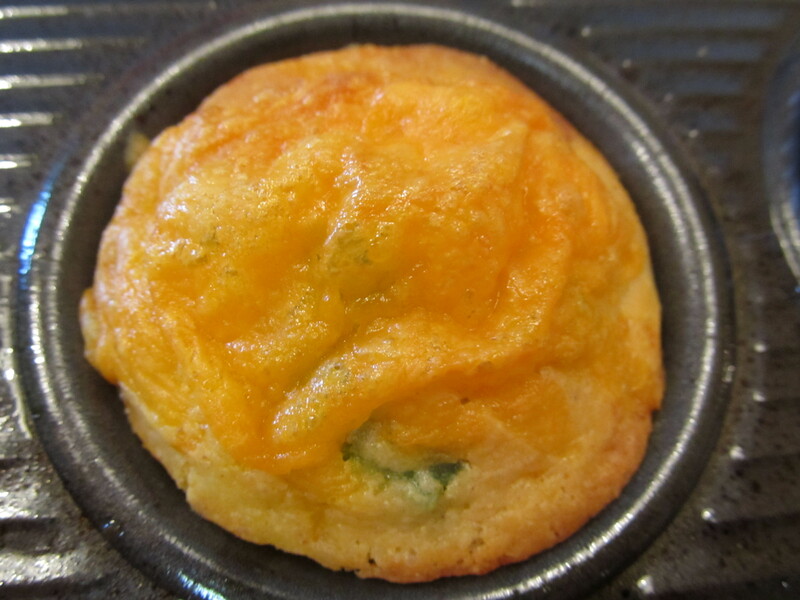 I was perusing foodgawker 2 nights later and came across this recipe for cheddar jalapeno cornbread muffins. I started reading the recipe and immediately was drawn to it. And I decided I needed to bookmark to try. 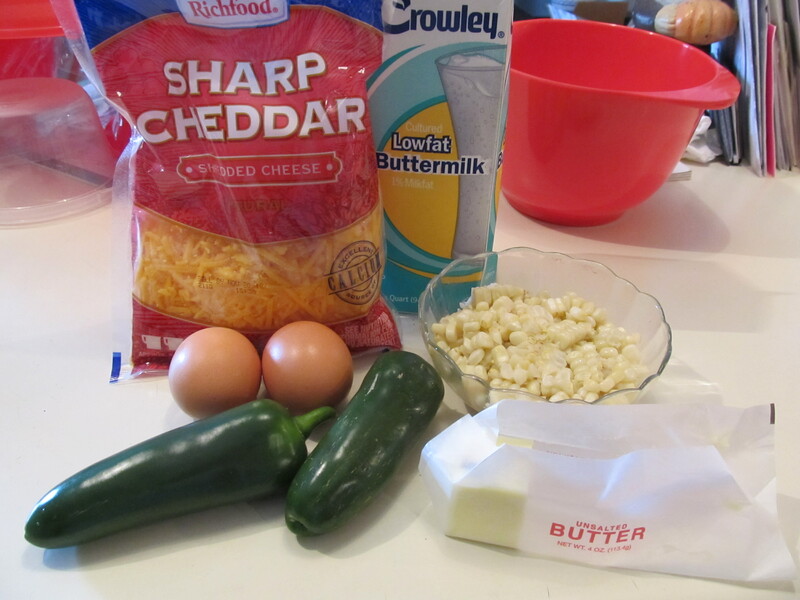 But I had some buttermilk on hand and had most of the other ingredients – including a fresh jalapeno from my garden! So I decided to try this recipe ASAP! 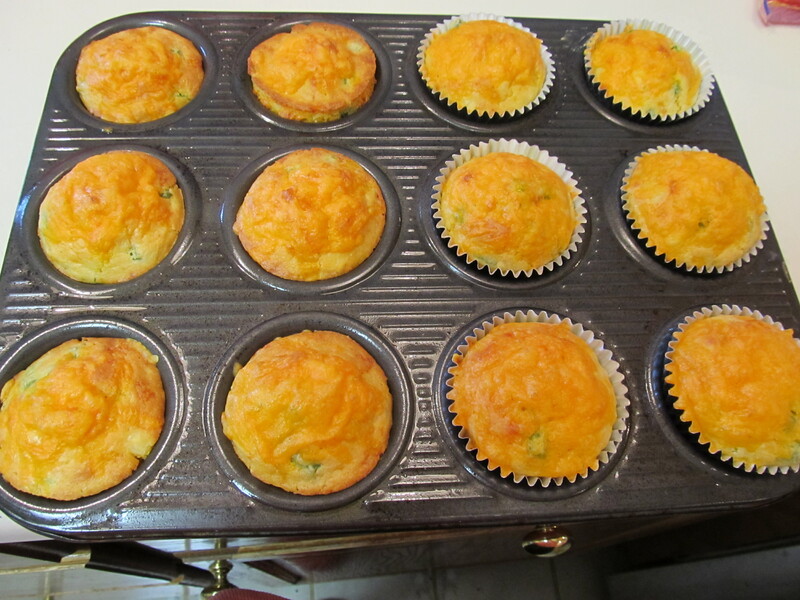 This recipe definitely makes more than 12 muffins as it says…..My count was about 24 muffins. 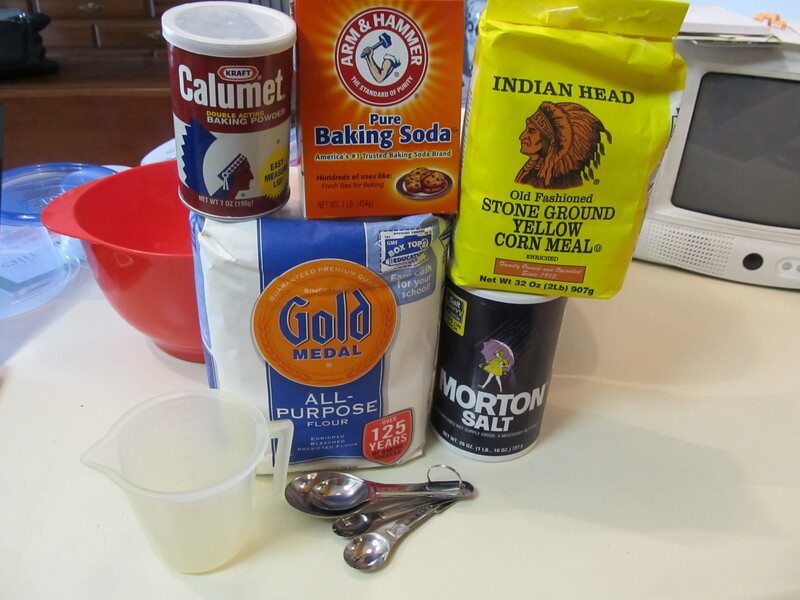 In a large bowl combine the flour, cornmeal, baking powder, baking soda and salt. 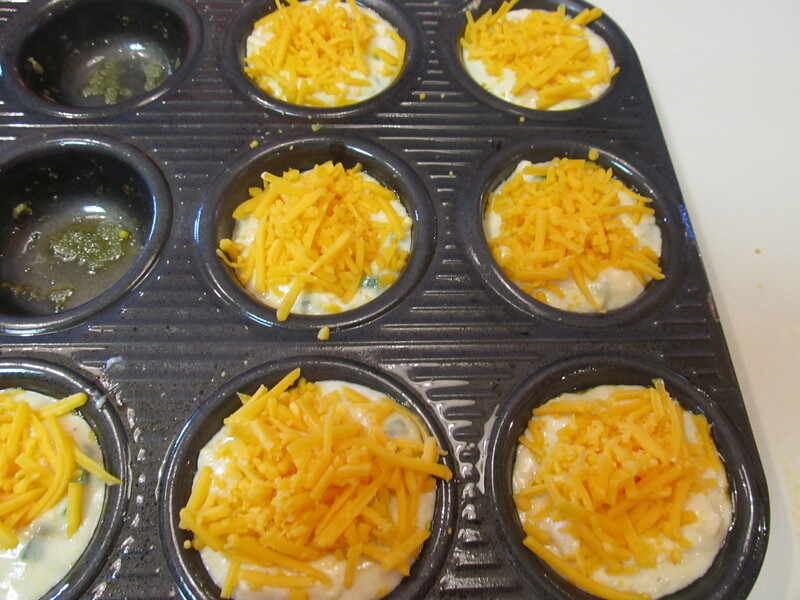 In another bowl whisk together the buttermilk, eggs, cheese, and butter. With a large spoon slowly stir in the wet ingredients to the flour and cornmeal. 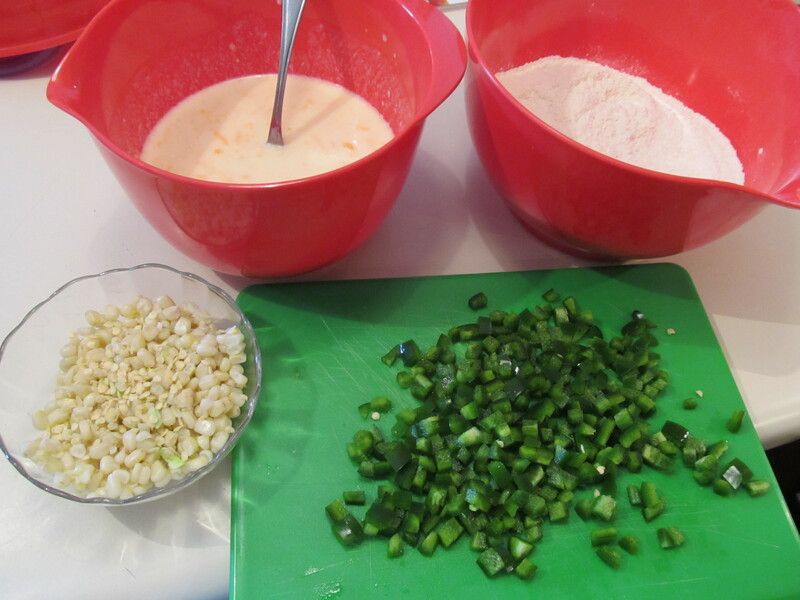 Add the corn kernels and jalapenos.